One of our outings while in Prague was to Kutná Hora and Kostnice v Sedlci (the Sedlec Ossuary). We started our trip off at the Ossuary. An Ossuary is a final resting place for human skeletal remains. It’s used when space is limited. 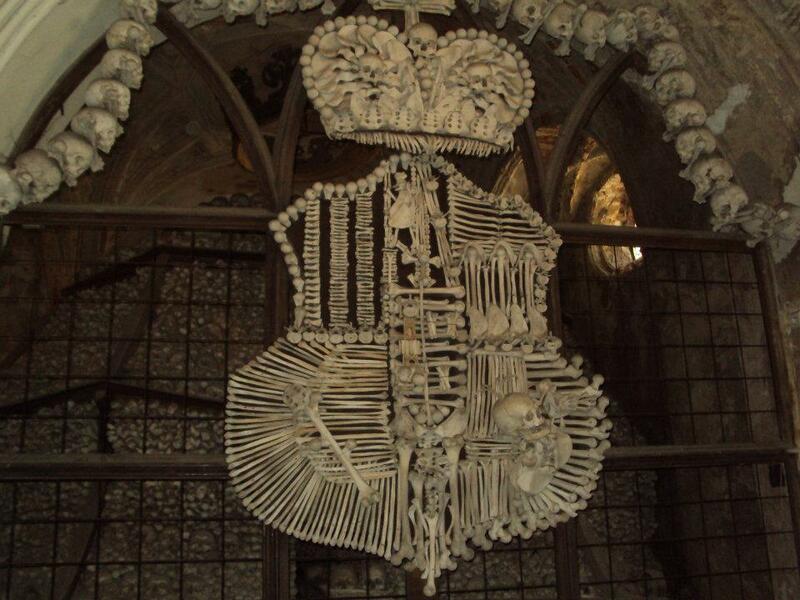 The Sedlec Ossuary contains the remains an estimated amount of 40,000 people. Originally the job of organizing the bones was entrusted to monks of the church. 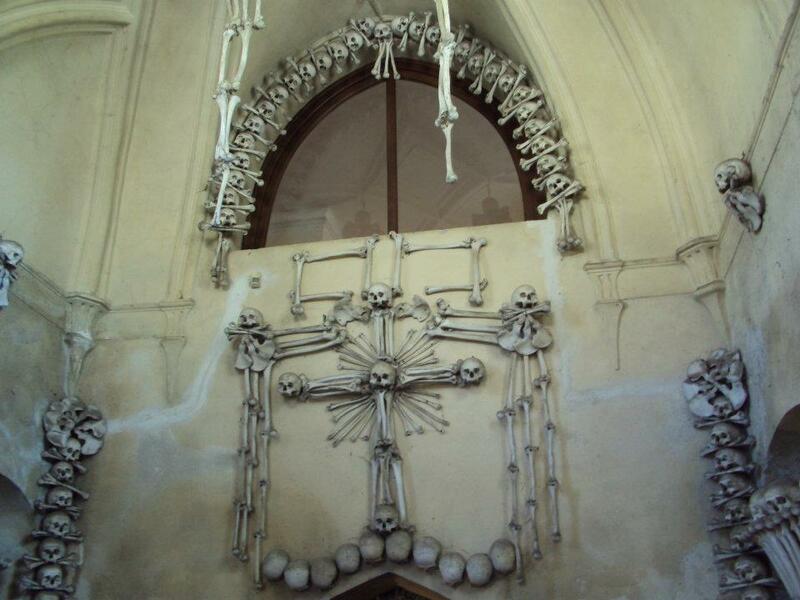 Later in 1870, the owners of the land, the Shwarzenberg family hired a woodcarver named František Rint to organize the bones and to decorate the chapel. 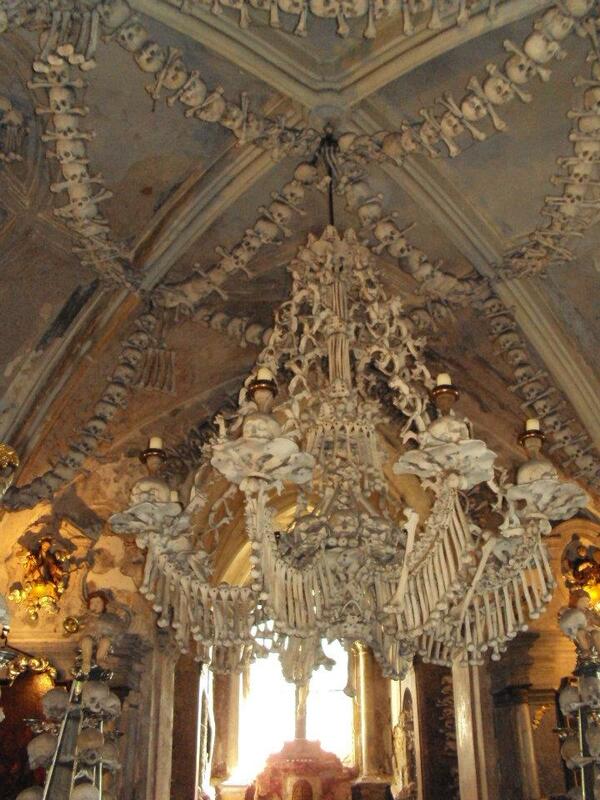 He made a coat of arms for the family, chandeliers and other decorations with the bones. The Ossuary is inside the church past a peaceful cemetery and downstairs. It isn’t for the faint of heart. A couple classmates and friends were unable to stay long and ended up waiting for our group to return to the graveyard. After visiting the Ossuary and the church we continued on our trip to Kutná Hora. 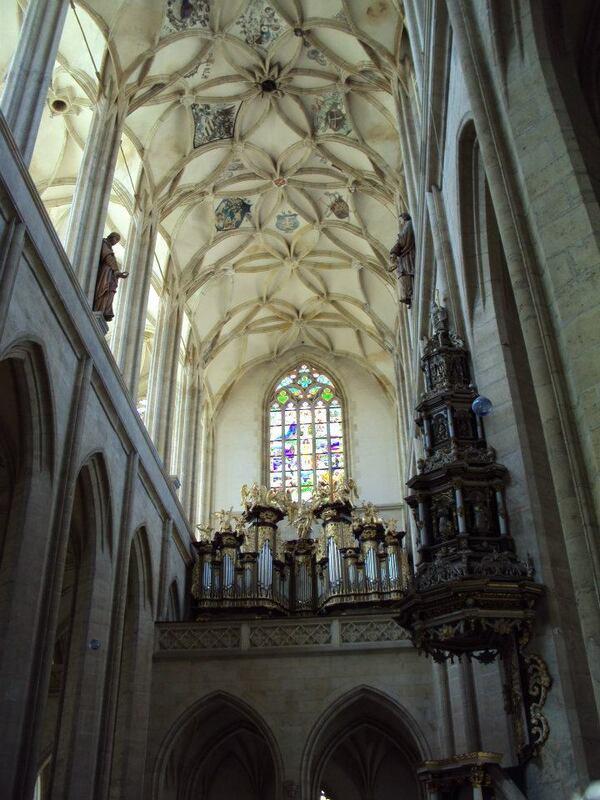 Our teachers had given us choices since we didn’t have a lot of time in Kutná Hora. We could go for a medieval silver mine tour, to a museum, or on a walking tour. 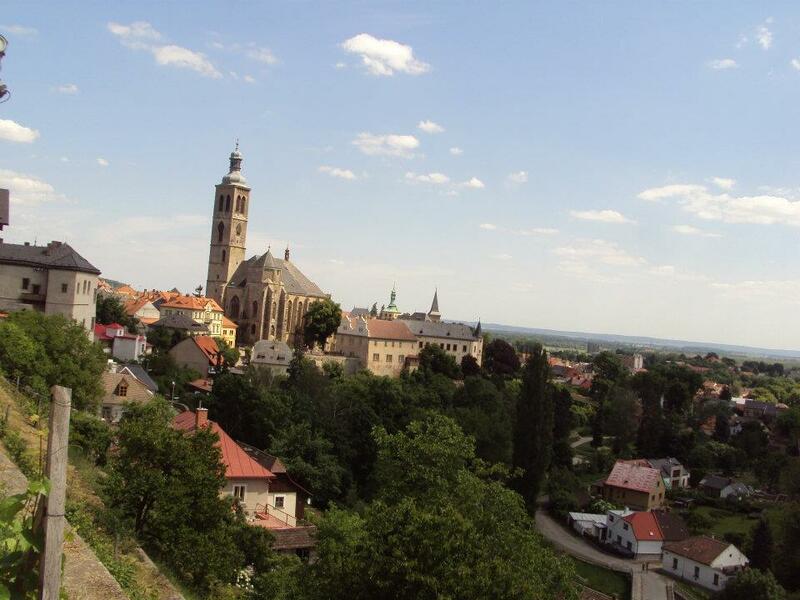 Kutná Hora was the place where royal silver was mined and sent to the castle and royalty in prague. The people who chose to go on the mining tour wore traditional mining gear, a canvas white kirtle or perkytle with a hemet and lamp and went down into the mines. I picked the walking tour. Our tour guide took us across a bridge that overlooked Kutná Hora. The bridge led to the church St. Barbara (Chrám svaté Barbory). Saint Barbara is the saint of miners, which the town was full of as a mining town. The church was built through the donations of the people, guilds, and even beggars were said to have donated their money so the church could be built. The church was built by the best in the country, with the money raised the town hired the kings architects to build St. Barbara. On the ceiling of the church are the coats of arms for several of the donators, and the guilds that helped fund St. Barbara. Our tour guide explained most of the church and took us around town, telling us stories of haunted restaurants. When we finished with our walking tour we went back to the area by the bridge that was right next to the museum and where the mine tour was. There was people dressed up in medieval clothes, fighting on the bridge and we grabbed lunch while we waited for the other groups to get back. We had a limited time before our bus would be back to pick us up and there wasn’t as much time as I would have liked. I would have liked to have gone on the mining tour as well as the walking tour. The restaurant we picked was pretty bad despite the outdoor seating. The food wasn’t that good and the service was pretty bad. We ended up being pretty late to get back to our bus. The Sedlec Ossuary is located at Zámecká, 284 03 Kutná Hora under Hřbitovní kostel Všech Svatých (Cemetary Church of All Saints). 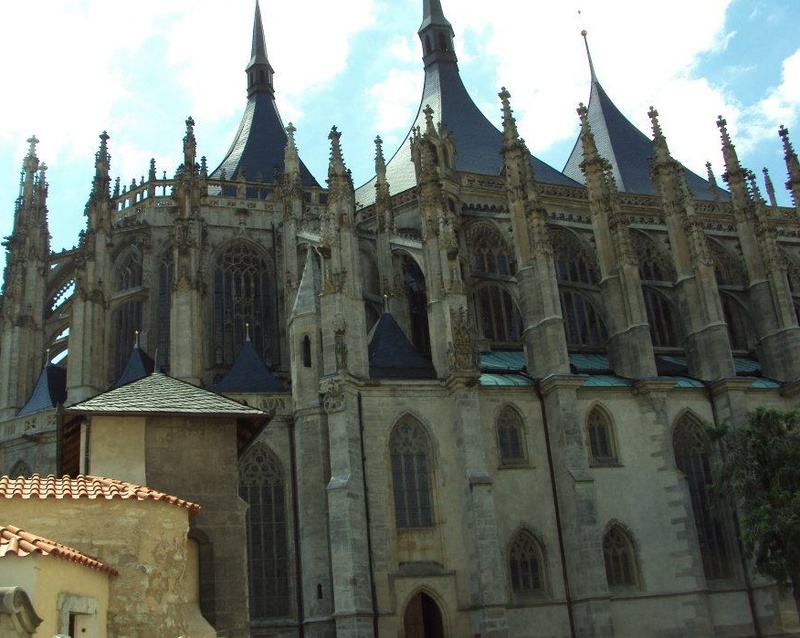 Kutná Hora is about an hours drive from the city of Prague.